Every start has an end. Everything, no matter good or bad, will comes to an end. The only thing that never end is our friendship. I don't know how time count, I don't know how our friendship rated, I don't know how much we hate each other and I don't know how much we love each other too. But I know, I don't want to count the time because it does not stop running to the end of it. I know there's nothing can be used to rate our friendship because our is stronger than anything in the world. I know we won't hate each other for a long period. I know that you love me more than I expected and I love you too. Just a blink of eyes, almost 731 days gone. We will be graduated soon. We will never know if we will ever be together again in the future, but with the heart, I know we can. This could be the last BBQ we had. I'm glad that you all came yesterday. We had fun, we talked, we laughed, we cam-whore-ed. In my memories, there are not more than 10 times we gather around, I can't even remember, that's why I organized this BBQ just to have the most remember one. I will remember this for the rest of my life. I really touched that you can make it because it is kinda last minute plan. I don't mind paying a little bit more just to see everyone of us happy. The happiness in everyone's eyes is a rare thing. I see everyone enjoyed this farewell party. It could be rather short as we end this BBQ at around 11.30pm. I hope it can be longer, I even hope it won't end. That's why I said that I don't want to count the time. It hurts. 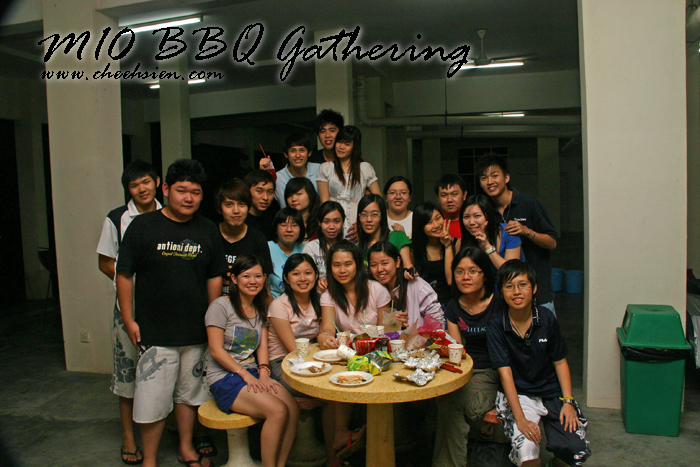 Perhaps, we will gather again during CNY or other special events. Don't forget our 10 years' appointment. Don't forget me too. p/s: Pls dont simply send my pic others har! haha.